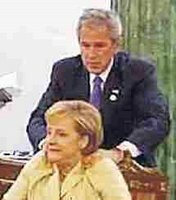 I've been following this incident of President Bush giving German chancellow Angela Merkel some sort of backrub with some interest. I first heard about it here. Then I read this New York Times article. I guess there's not much to follow, since the whole thing lasted a few seconds. (You can watch it here.) So I guess I've been following people's reactions to it. With all the horror that's going on in the world these days (at least 8 Israeli soldiers were killed in Lebabon today; a young Orthodox woman who lives on the Upper West Side committed suicide on Monday--will post on that later), it almost seems silly to comment on this. But unwanted touching is a subject dear to my heart so I just have this to say: Don't initiate intimate contact with anyone unless they specifically tell you that it's okay. (If you think that massaging or rubbing someone's neck and/or shoulders is not intimate, then I'm sorry for you.) And be extra careful with how you touch the leaders of nations. Um, it didn't look to me like a back rub or massage at all. It was just a friendly shoulder squeeze. It's not a big deal. It just looks like a massage from the video still, but when you actually look at it it's nothing.